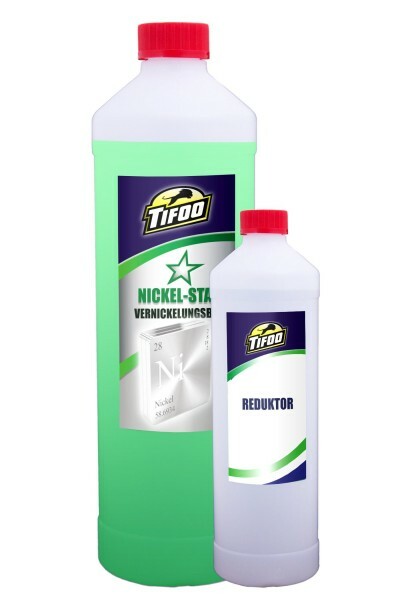 Product information "Nickel-Star with Reductor"
IMPORTANT: If you want to nickel-plate non ferrous heavy metals like brass or copper, please buy also the Tifoo Palladium activator in our online shop. The Tifoo Nickel-Star allows you to nickel-plate objects evenly. The nickel-plating done by yourself with the nickel immersion bath is really easy: just heat the nickel bath – ideally in a closed receptacle (see manual) – up to 80 °C and dip in the object to be nickel-plated without current. The so created nickel-phosphorus layer is even more resistant than pure nickel. If you want to nickel-plate copper, brass or other non-ferrous heavy metals (or their alloys) yourself, you first have to activate the object with the Tifoo Palladium activator. Youll find the latter on our homepage. With the Tifoo Nickel-Star, youll have a scratch-resistant nickel layer on numerous metals. In order to guarantee an especially long durability, the Nickel-Star consists of two components that have to be mixed before use. Please keep in mind that our Tifoo Palladium activator is also needed to nickel-plate non-ferrous heavy metals (copper, brass and bronze). In order to nickel-plate aluminium, youll also need our Tifoo Galvano Activator. All these products can be purchased in our online shop. We will happily answer to any further questions, when you need it. Related links to "Nickel-Star with Reductor"
Instruction manual for Tifoo Nickel-Star with Reductor as PDF file. 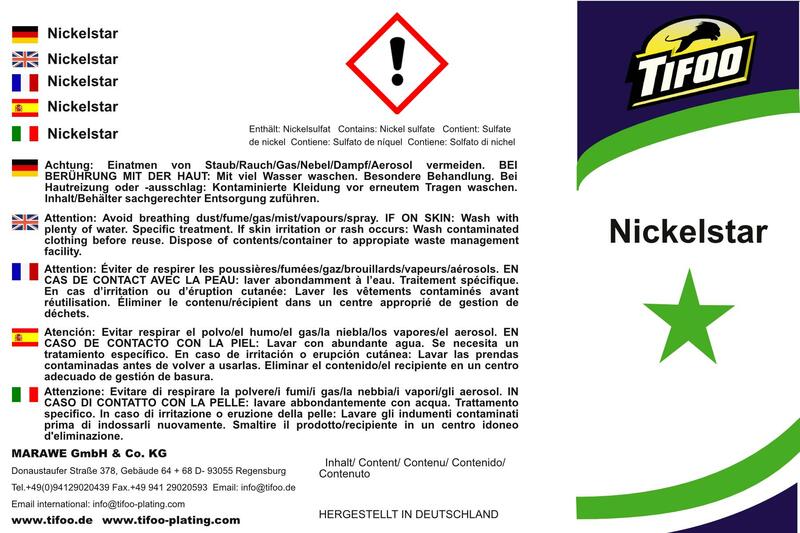 Customer evaluation for "Nickel-Star with Reductor"
Das Produkt hat bei uns erst im zweiten Versuch funktioniert. In der Anleitung steht 50 ml Nickelstar + 2 ml Reduktor, auf der Reduktorflasche steht 50 ml Nickelstar + 4 ml Reduktor. Zweiteres funktionierte dann. Dieser Fehler sollte korrigiert werden. Wir nutzen diese Lösung zur metallografischen Präparation und sie funktioniert ganz gut. Sowohl was Preis als auch was Aufwand betrifft würde ich sie den "Eigenmischungen", wie sie in manchen Laboren angerührt werden, definitiv vorziehen. Ich habe das Vernickelungsbad erstmals verwendet und es liefert ein wirklich hervorragendes Ergebnis. Die Anleitung ist detailiert und auch im Hinblick auf Sicherheit gut. Das Produkt kann man für jeden empfehlen. Man muß nur sauber arbeiten und sich an die Sicherheitsratschläge halten.